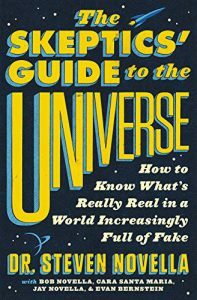 The Skeptics’ Guide to the Universe: How to Know What’s Really Real in a World Increasingly Full of Fake. By Steven Novella with Bob Novella, Jay Novella, Cara Santa Maria, and Evan Bernstein. Grand Central Publishing. 2018. ISBN-13: 978-1538760536. 512 pp. Hardcover, $19.49.